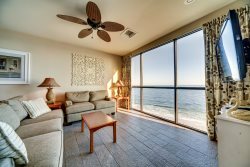 Newly Remodeled Oceanfront Studio, Sleeps 4! Perfect for our family of 4. Easy access to both pools and the ocean. By having the key pad lock we did not have to worry about having a key.